“Remind me again whose idea this was?” My sister was none too pleased at the blast of frigid air that hit us full in the face as we stepped out of Krakow Airport. It was late, the temperature had sunk to a challenging -28°C and I was beginning to see why Ryanair’s fares to the Polish city from a comparably mild London were so low. Our cheeks numb, we slid across the car park in search of the car we’d hired for the weekend and argued the toss over who was going to be first to try driving on the skid pan which doubled as the road to the city. She lost and I murmured a silent prayer of thanks. 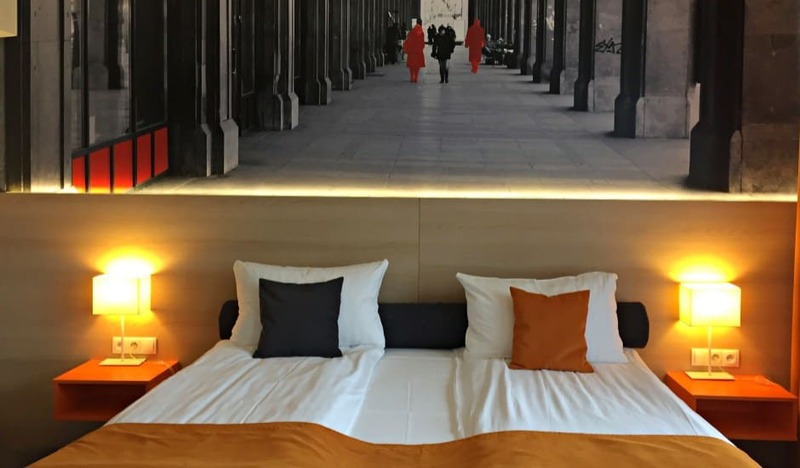 We’d chosen to base ourselves at the Novotel Centrum hotel, close to the banks of the Vistula River and a fifteen minute walk from Wawel Castle. It had a restaurant, a car park, reliable heating but no soul. It was a fair trade off. The trouble with character is that it can sometimes be uncomfortable. Having somehow made it to the hotel without an accident, we decided not to push our luck and, because of the weather, took a bus into the Old Town to find some dinner. In the dark, we got off a stop too early, but it was a pleasant walk which took us to the heart of Krakow. Our target was Rynek Główny. Better known as Main Market Square, it claims to be the largest market square in the whole of Europe. This vast square was originally laid out in 1257. 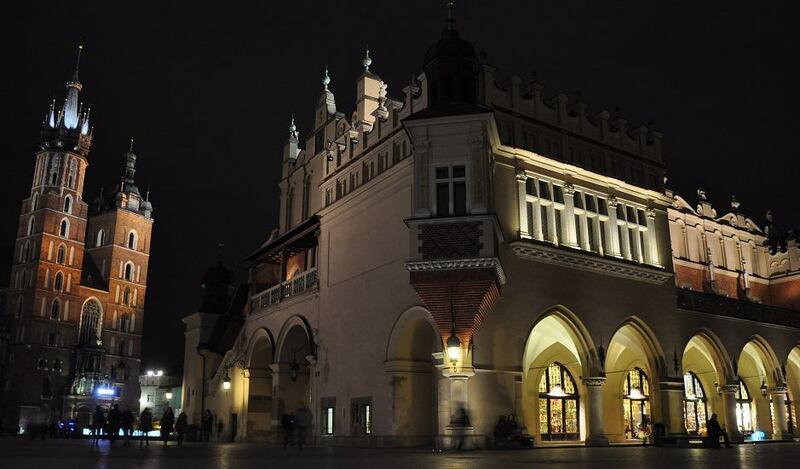 Few changes had been made in the intervening centuries, making it one of Krakow’s most popular tourist haunts. Over the years, it had been the scene of public executions, a popular revolt in 1794 and even a Nazi rally attended by Hitler himself. These days, however, it was charm personified. At the heart of the square stood the 14th century Cloth Hall, its colonnaded walkways featuring arched buttresses hung with wrought-iron lanterns. Inside were wooden booths housing little stalls selling everything from amber jewellery to carved trinkets. They were shutting up for the night, so we decided to return later in the trip to tackle it in daylight, together with the museum telling its story that had been located beneath it since 2010. Enclosing the square were rows of elegant mansions. Scattered across the cobbles in between were row upon row of stalls selling typical arts and crafts as well as a variety of local food. The pierogi cart was doing a roaring trade selling those traditional dumplings filled with beef, cabbage, cheese and spinach. Just the thing to cope with the cold weather, there were six variations. 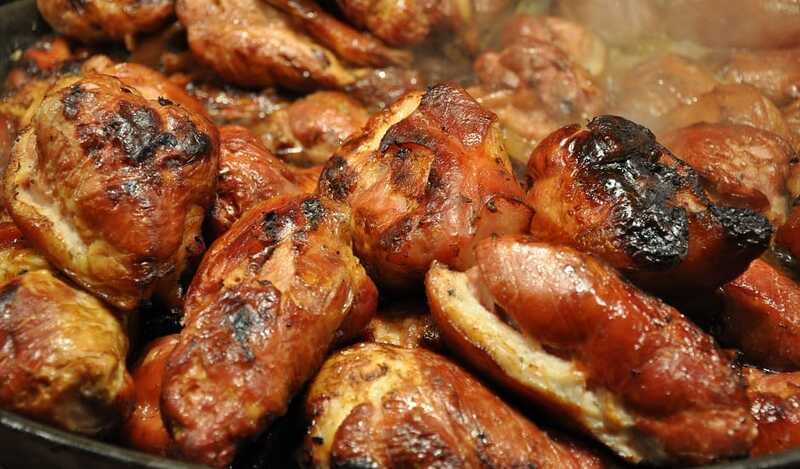 We had them all, the perfect street food appetiser. Now we needed a main course and glancing around, a neighbouring stall caught my eye; it had a well-seasoned pan piled high with glazed ham hocks next to an even bigger pile of fried potatoes. There were lots of accompaniments on offer: buttery mushrooms, colourful vegetables and every sauce you could wish for. We ordered ham hock with black pudding, grabbing a plastic cup of the local beer known as ‘piwo’ and dining in the not so salubrious surroundings of a picnic bench next to the public lavatories. The food was delicious; proof if ever you needed it that you didn’t need a fancy restaurant to dine in style. The centre of Krakow could easily have occupied us for days, its historic townhouses now repurposed as museums, cafes, bars, restaurants and of course shops. We made time to stroll the Royal Road, explored Wawel Castle perched atop a hill that had been settled for millennia and we also paid a visit to the atmospheric Kazimierz Quarter, the city’s former Jewish ghetto. But we’d hired the car for a reason: to explore further afield. 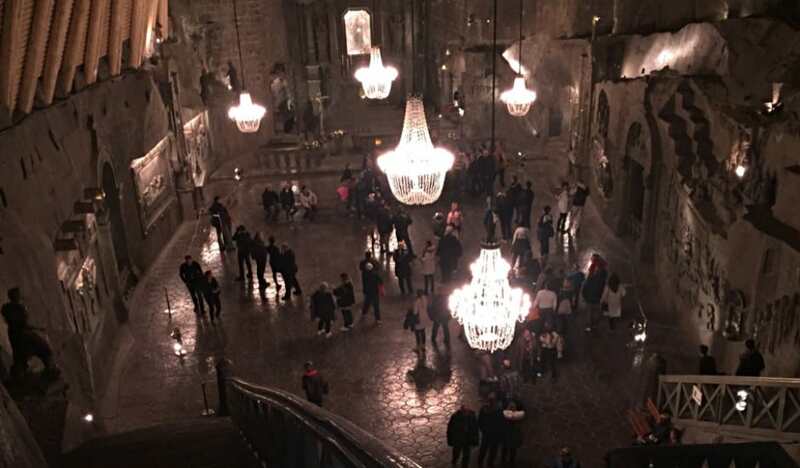 The salt mine of Wieliczka was less than a half hour drive from the hotel and promised to be a fascinating place to spend the morning. For this was no ordinary mine. Here, deep below the earth’s surface, salt was dug out from the 13th century until just a few years ago. The stats were impressive – the mine was 327 metres deep and 287 kilometres long – but it wasn’t just the dimensions that made it worth the detour. 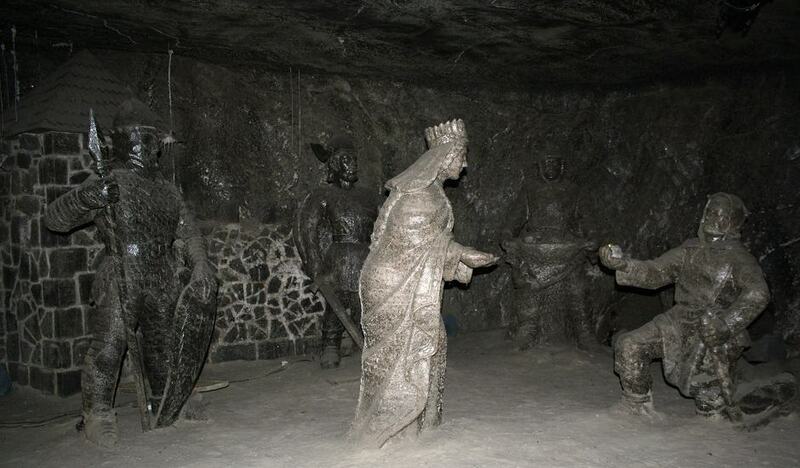 Over the centuries, miners had sculpted the grey rock salt into dozens of statues, chandeliers and even an underground chapel, leading UNESCO to list the place as a World Heritage Site. We followed a long line of distinguished visitors, including the revered astronomer Copernicus, explorer Alexander von Humboldt, scout founder Lord Baden Powell and even Bill Clinton. Pope John Paul II was here too, not only in real life but remaining as a statue carved from salt. Sixty kilometres west of the city at Oswiecim lay our final excursion: the Nazi concentration camp of Auschwitz-Birkenau. We could have taken an organised tour, but wished to take our time and pause for reflection, something we thought might be difficult in a large group. 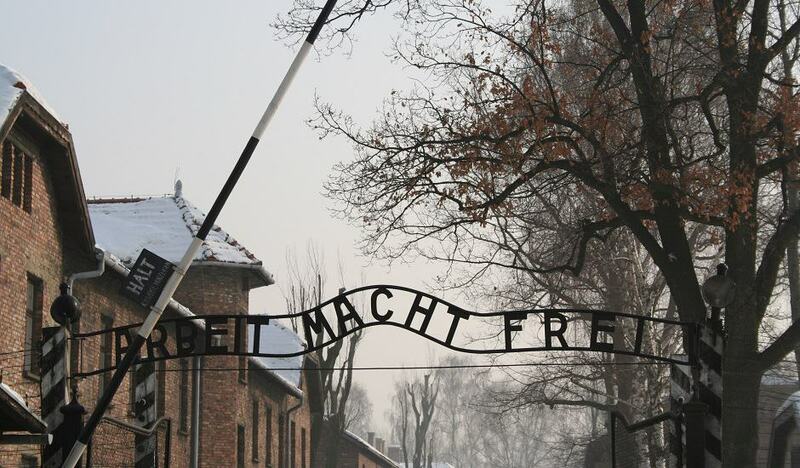 Operational for most of the Second World War, Auschwitz held Polish political prisoners at its inception in 1940 and later, over a million Jews, shipped from all over Nazi-occupied Europe to meet their fate in this infamous place. They were joined by Hitler’s other undesirables: Roma gypsies, Soviet prisoners of war, homosexuals. All were subjected to treatment so horrific we could barely comprehend it. It was a powerful and sobering place, the souls of the dead permeating those of the living. Certain exhibits punctuated our thoughts, forcing tears – a heap of children’s shoes, a pile of twisted metal spectacles, discarded artificial limbs, battered suitcases and display cases full of human hair. Outside, snow partially covered the train tracks as we made our way to the reconstructed living quarters. There, victims would have slept in unheated barracks, crammed onto wooden bunks covered with straw, their thin clothes no match for the cold. The Krakow winter is harsh on outsiders, but the recent history of this corner of Poland, however confronting, is an essential part of any traveller’s education.